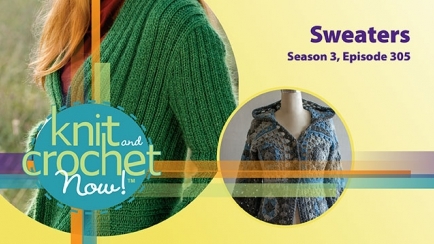 Robyn is first up with a fashionable granny square sweater designed by Tammy Hildebrand, and then Kristin will show how to knit a directional rib cardigan by Irina Poludnenko. Afghan Square this week is a Crochet Scalloped Shell. 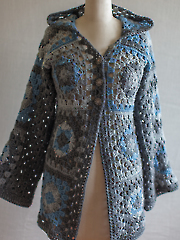 I also purchased this video for more visual instructions on putting the granny square sweater together. This really didn't help at all. I am very disappointed! I was really hoping this video would give more information or a tutorial for the sleeves and hood of the granny hoodie. Not really worth 4 dollars to because she only explains general crochet techniques. Not ones specific to this pattern. I really wanted some further direction on the sleeves of the granny sweater! Bought the video thinking that it would show me how to do them because the pattern confused me at this point. I suppose I will wing it and hope for the best. Danielle - You have made 2 Blocks and have attached them to center strip. Now you are going to work up those 2 blocks and in block 3 of center strip and then across the side seam and across block 5. This is forming your underarm. Let us know if you need any further help.